For many hundreds of years, the network of trade routes known collectively as the Silk Road promoted the exchange of not only luxury goods including silk, but also ideas, religions, and countless other cultural dimensions, linking China, India, Central Asia, the Middle East and Africa with the Mediterranean and Europe. Trade along these channels facilitated development of the great civilizations of Asia and Rome, and in many respects advanced the foundation of western culture. The wealth created by this trade supported the creation of fabulous art in Central Asia, including textiles, painting, ceramics, architecture, poetry, music, and dance, concentrated particularly in the cities of Bukhara and Samarkand. Artistic inspiration has always arisen not only from faraway points along the trade routes, but also from urban culture in nearby Iran as well as local rural 'folk' traditions. While the first major step in opening the Silk Road between East and West came with Alexander the Great's eastern conquests in the 4th century BC, the intellectual and artistic zenith of the Silk Road cultures took place between the 8th and 16th centuries. Many examples of the artistic accomplishments of these civilizations survive to this day. The principal languages of contemporary Central Asia belong to the Turkic and Iranian linguistic families, with the additional more recent influence of Russian. While Islam has become the predominant religion since its introduction in the 8th century, several religions have left indelible traces, particularly Judaism, Zoroastrianism, Buddhism, and Christianity. Suggestions of even earlier local polytheistic belief systems can still be found in modern-day Islamic religious practice. While many cultural elements arrived in the west over innumerable generations of contact with the east, especially during the period of the Crusades from the 11th - 13th centuries, Europeans traveling the Silk Road brought back tambourines, lutes, and other musical instruments, which eventually developed into the European piano, guitar, violin, and brass horns. Partially due to a fundamentalist interpretation of Islam during the 19th century in Central Asia, and partially since many other professions were closed to them, the principal performers of the Bukharan music and dance traditions have long been Jews, whose presence in the region dates from ancient times. At the same time, Jewish women became the leaders of troupes of professional singers and dancers. 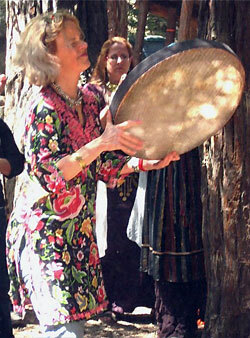 While most of the great artists of these traditions have now emigrated to Israel and the United States, dance ethnologists may still benefit from study with some of the great artists of this genre still in residence in Bukhara, including for example the Jewish Akilov family, with a continuous performance legacy of over two hundred years. While the humanistic philosophy from the realm of the ancient Silk Road has attracted much attention in the West in recent years through the poetry of Rumi, another 13th century poet who is relatively unknown outside of Turkey but who has also had a profound and lasting influence is the mystic Turkish poet, Yunus Emre. Since most of the philosopher-poets around the time of Yunus Emre were composing exclusively in Persian or Arabic language, their teachings remained largely within the domain of highly educated, elite male circles. Yunus Emre was one of the first Turkish poets to communicate in the vernacular of the Turkish people, therefore reaching a much larger audience with his mystic poetry. Among the primary themes of Rumi, Yunus Emre and other philosopher-poets of the East is the striving for re-connection with the Divine through love and respect for all creation and all people, regardless of one's station in life.